lend Roppongi Hills an air of the surreal! Born 1978 in Tehran, Iran. DOLATABADI graduated from Azad Art University in 2001. Since 1994, she has exhibited artworks in Tehran, New York, Tokyo and elsewhere. In 2009, she participated in the exhibition “No Man’s Land” at the Embassy of France, Japan. She currently resides in Tokyo. Hand from Above is a work that encourages us to question the everyday actions that we do without thinking. A giant hand suddenly appears on a screen placed in the middle of the city, grabbing at, tickling, and metamorphosing the real-time video images of people who are walking through the streets. Playfully teasing the passersby, the work attracts the attention of all those around it. Inspired by the tale of Goliath, the work poses the question, "What if humans were not at the top of the food chain?" A British artist and designer who creates many works that use technology in interesting ways to challenge our usual concepts of space. He has been commissioned to make works for the Design Museum in London and the Science Gallery in Dublin, and he has collaborated on many projects with other artists, including Silent Studios and rAndom International. Recently, his Hand from Above has attracted a lot of attention. It was originally a part of “BBC Big Screen,” a project held by the BBC, The London Organizing Committee of the Olympic Games and regional governments. It was held in various areas around the UK. O'SHEA has also provided many ideas to and collaborated with other artists, such as Jason BRUGES and Moritz WALDEMEYER, and their works together have been shown in the motion graphic film festival “onedotzero,” the Royal Opera House, Southbank Centre, Tate Britain, V&A Museum and so on. O'SHEA is also a co-founder of the networking series for young creators, "This Happened." ICHIKAWA Takefumi, who is known for sculptural works using floating balloons and sound performances with music, here makes his first attempt at painting. A large semi-transparent fabric is hung from the ceiling. With colors painted on both sides, it resembles an aurora as it gently sways above viewers’ heads. What’s more, visitors can not only look at the aurora from outside, but can also go inside it. It’s a mysterious installation that is at once a painting and a sculpture. Come and experience Roppongi Hills "aurora," as it continually changes its form with the weather and the time of day. As the visitors scatter paper snow flakes, the young leaves sprout from the flower bed, the buds grow and, eventually, bloom. As more people participate in the work, then even more colorful flowers bloom, and then wither. In this way, the viewers' desire to make the flowers bloom leads directly to an opportunity for interaction with other people. While the work is digital and it utilizes advanced technology, the physicality of the snow flakes and the flowers gives it an analog feel. Born 1974 in Tokyo. Graduated from the Department of Imaging Art, Faculty of Art, and the Master Course of the Media Art Department of Tokyo Polytechnic University. Interested in using interactive arts to create opportunities for communication between people. Also serves as an assistant professor in the Media Art Department in the Faculty of Art at Tokyo Polytechnic University. Making reference to TANIZAKI Junichiro's In Praise of　Shadows, MARTINELLI uses shadows to reconsider the relationship between the city and people. 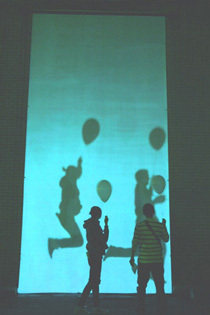 In this work, the shadows of passers-by are created by a flashlight and displayed on a screen. Rather than disappearing immediately, the shadows linger. When a moment of your life is captured in a shadow in this way, it leads to the odd sensation of having been liberated from your body. Born in Treviso, Italy. MARTINELLI studied literature and received a doctorate in contemporary art at the University of Padua. In the 1980 and 1990s, he created works focusing on the reciprocal effects of shadow and light. He participated in the Venice Biennale in 1995. A large flower suddenly appears in the Mohri Garden in Roppongi Hills. Appropriate to a Japanese garden, the work is a lotus flower, and with its giant size and garish colors it stands out so much as to transform the landscape. A leader of the South Korean art scene, CHOI is capable of breaking down the border between art and everyday life. His works never fail to provide viewers with new surprises and exciting discoveries. Born 1961 in Seoul, South Korea. Graduated from the department of western painting, Hongik University. Creates large scale works with traditional bright colors and also pop and kitsch shapes and materials. Currently active internationally, not only as an artist but also as an art director and interior designer. Resides in Seoul. On a night when art blooms like cherry blossoms throughout the town, why not take some time out to sit down among the nature in Roppongi Hills and relax, like you would on a sofa at home? Danish furniture maker “BoConcept” has created a super-long sofa just for this night and just for Roppongi Hills. Come and make yourself at home. An interior brand from Denmark. “Bo” means “life” in Danish. BoConcept proposes new concepts for lifestyles through its functional and simple products suited to modern interiors. BoConcept products are sold in 45 countries worldwide. In their branch in Roppongi Hills, BoConcept displays prestigious limited editions for high-end users and also holds seminars and events. A spotlight illuminates the stage. Walk to the microphone and send some message to the girls in the crowd – just like you were a star. The girls will respond with either shouts or whispers. It all comes down to you – whether or not you have what it takes to become a ‘star.’ A fun interactive artwork where no one knows what will happen. *For programs taking place within Tokyo City View, there may be times when the works cannot be seen. Your understanding is appreciated. Born 1965 in Fukuoka. In 1990, MATSUKAGE participated in the Venice Biennale Aperto exhibition as a member of the unit ‘Complesso Plastico.’ He is active in a wide range of fields, from photography to art direction. He is also known as a member of the ‘The Group 1965,’ which consists of artists born in that year. A 30 meter-wide mural appears at an intersection in the city. The characteristic abstraction of BOTTAZZI’s painting will change the landscape in a subtle yet dynamic way. Within the simple composition, clear and vivid colors and soft forms emerge, fly away from the surface and remind us of the depth of many layers and the passage of time. Simultaneously the work beckons us to a dimension we have never seen, and stimulates our imagination. Born 1971 in Lyons, France. BOTTAZZI creates oil paintings predominantly and holds exhibitions at museums and galleries around the world. 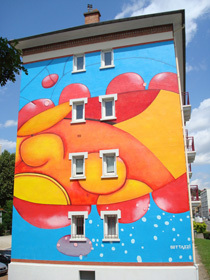 He also creates large public art pieces such as murals. Video works by artists will be screened on monitors and screens throughout Roppongi Hills, adding surreal visions to everyday landscapes. Meanwhile, at the Hills Café / Space (2F Roppongi Hills Mori Tower), video works will be screened uninterrupted from the following times. * Programs, artists and works subject to change. ■Venues : Hills Cafe / Space, West Walk, Family Room, Metro Hat, etc. ©2000 Maximum Films / LWT / Greenlight Media AG. ■Films: Three artistic films selected by MODAISTA. 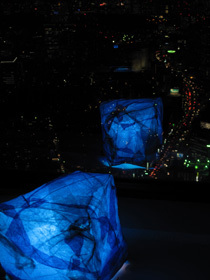 「Night Sky Umbrellas」in Ropongi Art Night 2010! On March 27 only, Tokyo City View will be open until 6 a.m. the following morning. And admission after 24:00 on March 27 is just ¥500! Tokyo City View, which usually closes at 1 a.m. each morning, will say open on the night of Saturday, March 27, until 6 a.m. the following morning. Round out your art night with the mesmerizing spectacle of the sun rising over Tokyo, bathing the grey dawn with light. * Admission after 24:00 on 27 March (Sat) is ¥500. Your favorite Roppongi Hills restaurants are rolling out the gourmet wagons. The gates to the private Keyakizaka Complex Roof Garden will be specially open to the public Saturday and Sunday (subject to capacity and time limits). Celebrate the arrival of spring with a festive time in the Hills! 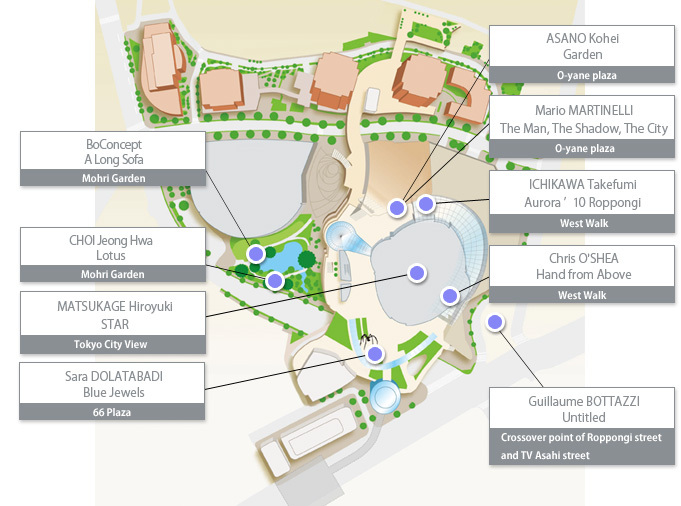 ■Venues : Mohri Garden, etc.